This post was originally published last year before Thanksgiving. This is still a great way to make your holiday bird, and it remains my favorite way to prepare turkey. Happy Thanksgiving! So what’s the big secret? Butter. And to make it really special, a compound or seasoned butter. What is a compound butter, you say? 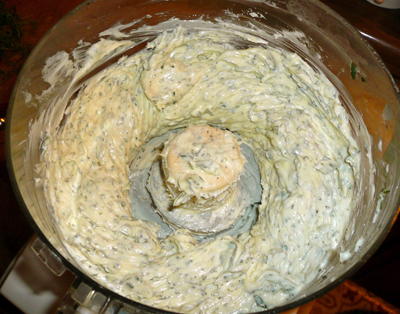 A compound butter is a butter that is seasoned with herbs and spices. You can use fresh or dried herbs, citrus zest, aromatic vegetables such as onion and garlic and your favorite spices. The great thing about a compound butter is that you can add any flavor profile you want. Seasoned butters are easy to make, and add so much flavor to any number of dishes. I usually make a large amount and freeze it, then slice off what I need as I need it. This recipe makes a pound of seasoned butter, but smaller amounts are just as easy to make. I used a food processor for this, but only because I was using a lot of fresh herbs, was in a lazy mood and did not feel like chopping the herbs by hand. 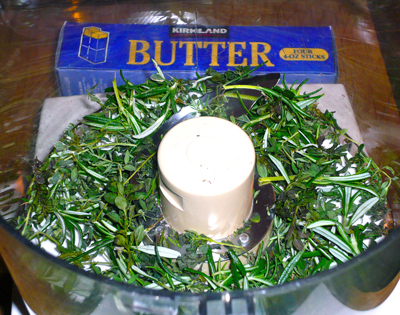 If you are doing a butter with just dried herbs or spices, its easy to make it by hand. The key to a compound butter is to make sure your butter is softened. Not melted, just softened. You want all the ingredients you are using to be evenly distributed in the butter. Be flexible with your ingredients, and don’t worry about exact measuring. Add a little of this, a little of that and TASTE! Then adjust your ingredients as needed. I have included approximate measurements so you have a basic idea of the amounts needed to make a good seasoned butter. 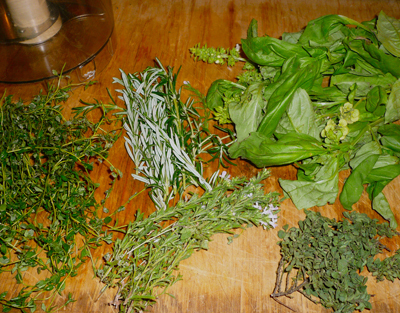 Strip the leaves of your herbs from the stem, and place them into the bowl of a food processor. The thyme I used was so tender and fresh the stems were not woody, so I didn’t worry if I got a bit of stem in the processor. But if the stem is woody, be sure to strip the leaves off. You can keep the stems for seasoning stocks if you wish. Just wrap them tightly and throw them in the freezer. Chop the herbs roughly in the processor. Add the butter and process until smooth. You will have to stop the processor a few times, and scrape down the sides. The butter will be soft and smooth when done. 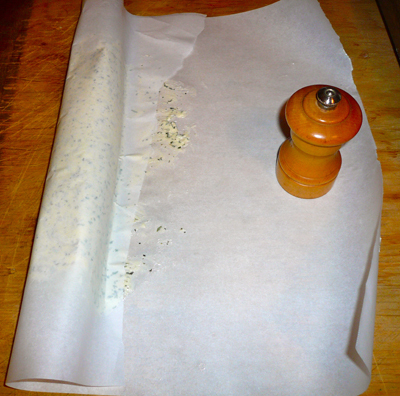 Place a piece of parchment paper on a flat surface. If you don’t have parchment, use wax paper. Scrape the butter out of the bowl, and put it in the bottom 1/3 of your parchment. I used a rolled parchment, so I needed to weight it down to stop it from rolling back up on me. That is why you see my pepper grinder in the picture. Fold the short end of the parchment over the butter tightly, and begin smoothing the butter out while shaping it into a log. Press firmly but gently on the parchment so any air bubbles are smoothed out. Pull back on the parchment that is folded over the butter to tighten and compress the butter. 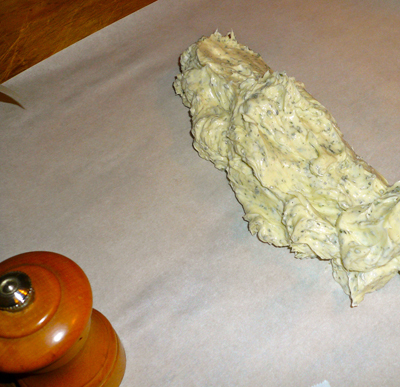 Roll the butter up completely in the parchment paper, and fold the ends to close it. If it’s not perfectly round, don’t worry! It will still taste good, and that’s whats important. The cylindrical shape just makes it easier to cut when it is frozen. Kind of like a tube of cookie dough. Place the roll in the refrigerator to firm the butter up, and it is ready to use. If you wish to freeze it, wrap it in a couple layers of plastic wrap. When you want to use it, just unwrap the frozen butter, and cut off slices with a sharp knife. Then re-wrap and put it back in the freezer. To make your Thanksgiving turkey moist and flavorful, rub your compound butter all over your turkey. Lift the skin of the turkey and rub some butter directly on the meat, especially the breast area. I even rub the inside of my turkey before I place my aromatic vegetables in the cavity. Then roast your turkey slowly in a 200 – 250 degree oven, basting often with the drippings. You can use the butter for flavoring other dishes too. Whatever you make with your butter, enjoy it and be sure to experiment with different flavors. I love to make seasoned butters. Like bacon, makes everything better! I’ve never used herb butter to season turkey, but I do make it every summer. We eat it as is…on bread…and lots of it! My favorite combination is basil, parsley, tarragon, chives, and chervil. I love a good butter compound. I need to find a reason to get one on the holiday table this season!